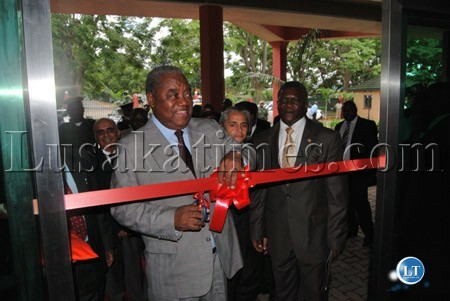 President Rupiah Banda cutting a ribbon during the official opening of Fairview Hospital. 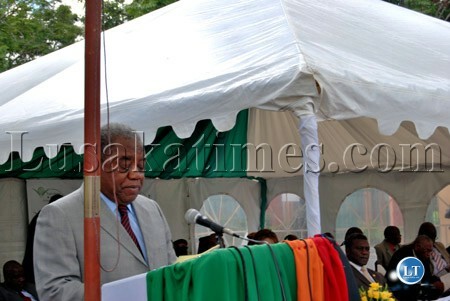 President Rupiah Banda speaking during the official opening of Fairview Hospital next to Cell Z house. 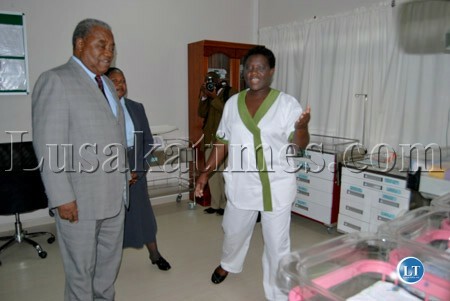 President Rupiah Banda during a tour of the Fairview Hospital after he officially opened it. Fairview Hospital's Neonatal Nurse Misozi Zulu welcomes President Rupiah Banda when the toured the institution before he officially commissioned it. 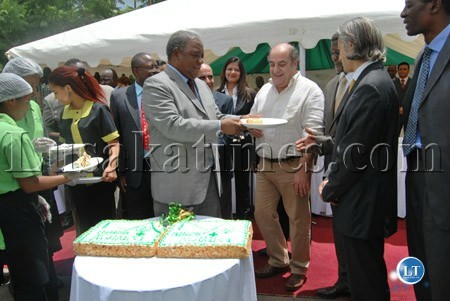 President Rupiah Banda offering a plate of cake to Fairview Board Chairman Mr Andronikos Antonopoulos at the official opening the Hospital yesterday in Lusaka. 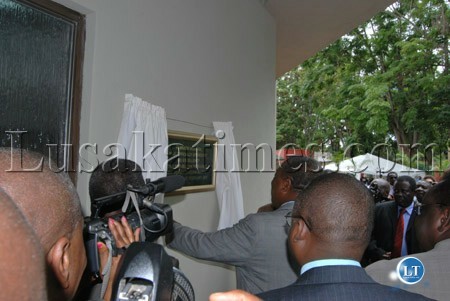 President Rupiah Banda unveils plaque during the official opening of Fairview Hospital in Lusaka . I’m in the dark. Is Fairview a private hospital?? Thanks for the info. Hopefully this will mean no more evacuations to SA. Can this ignorant ape clean up UTH before cutting ribbons at other hospitals? #1, Our undergraduate students will reveal the answer shortly. GRZ hospital is yet to open. Well done Fairview. Hope FTJ will go for his medicals there. Oops, let’s not forget RB for his kneel, the Cobra & his wife for their hearts. Oops, lets not forget the laptop doctor , etc. As an MMD die hard, you are in the dark over what your president is doing? If you don’t know these small matters, how come you claim to know “bigger” things? I have never claimed to know “bigger” things and I challenge you to provide easily accessible irrefutable verifiable evidence to prove I ever made such a claim. Number 5, hello prof, I am working with our undergraduate students on the study. We will shortly present our findings which we hope will assist government in improving our already existing medical structures. Thank you for being there for us as a student body. this is how useless we are as a nation,a president has to commission construction of roads,and he is there to officially open any building around,or any bought equipment,awe sure!!! Its good that you’ve finally accepted you know very little about things you spend hours supporting. We’ve always known you just a sick marverick who comments on everything most of which you got no clue about. And I should care about your comment….why??? Come on bloggers #1 has never claimed to have the monopoly of knowledge. he just asked an innocent question. We should learn to share information. Though we have different political beliefs, we can still live in diversity peacefully. Hey just appreciate that this guy is working. what a contrast. Nothing is so special about this hospital. No beds and no surgery room shown apart from the out side view. Kasonkas, mwabas etc? These should have by now teamed up, partnered with the business world, raised capital and pulled of the best regional hospiital right at the same spot. Instead, thanks to fragmentation, none have risen to the challenge as in to pull it off at that level. Indeed one can attribute our blatant innertness to the lack of entreprenuerial exposure in our various curicula but that shouldn’t leave us to ignore money making opportunities. Let’s wake up instead of being quick to just criticise. He might as well go open some toilet doors with ribons on at UTH. Iam told UTH is in a bad state that even Daily mail or times of Zambia can´t recall when Mr Banda paid a visit there. Ba Ras Rated. Don’t operate on hearsay, why not go there and make a difference? Why not restrict your commenting to soccer where even the myopically minded like you can comment? Clearly you don’t have the intellect to comment on much else. Fulham is playing chelsea at craven cottage, drogba is on the bench are you able to comment as to why? And why is the ball white? The retarded politics of africa never cease to amaze me. While the oppening of a private medical facilities is commendeble to the respective investors and a plus/necessary evil in fostering competition. However, what is mind boggling is that the Zambian president has the odessity to parade around, monkeying around the oppening of a private hospital when his own very own govt/public hospital is in deplorable & disgusting condition. If private investors can raise $40 million to open a facillity, what is the government doing failing to maintain its own facility? The president & his cronnies should be embarrased to have to commission a private hospital when the state hospitals are crap. Do these so called leaders take pride in taking flight to South Africa when ill at the tax payers expense? @ bibo4shizo no # 10, my thoughts exactly. There has always been solutions to Zambia’ s problems and the all involve not electing certain individuals into office. These individuals are from all three Political titans due to lack of a better word. UPND MMD and PF if you were wondering. When was the last time a Zambian president officiated the opening of a JICA funded rural educational programme in Shagombo ? Yes indeed where are Zambia’s elite medical practitioners?The mid-level medical professionals are entrepreneur wise establishing works it’s always the upper echlon that let’s us down. progress for zambia even if its expensive for now its okay dont forget that more hospitals in time will mean competition which will mean low prices things dont happen overnight SO VIVA ZAMBIA VIVA. LT is this a newyears resolution to moderate comments if so you indeed are welcome to my congratulations. Here is another pointer please moderate all the political banter that now prowls the once news diverse LT. Not everything is political and so though I am for freedom of speech, there are too many single track minded individuals on here; were are the brains to lead our younger generation up yonder into the base of moral civilization. Is this a Hospital or a clinic? How about the bed capacity ,surgical facilities ifyama X-ray etc? Why being commissioned the president instead of the Health PS/ Minister? Why make my president so damn cheap? Who really plans this degradings of the top most office? Its a comment and not a question for to answer, numpty. Capitalist you sound like you can sue and claim Billions from my mate msana wanzili. # 22: U’v a pont, our president has becom so cheap, opening a PRIVATE hosipital could’ve been done by the PS in the ministry of health. 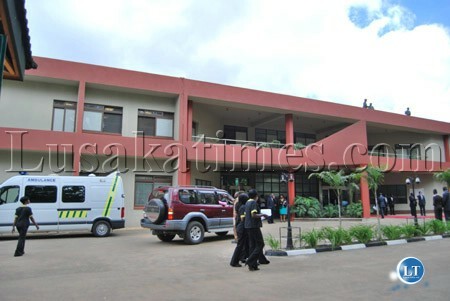 And Its the equipments not A BULDING, which makes a hospital, so it could have made more sense if the pictured showd inside that ka bulding. Nevertheless,having an additional hospital is a step ahead in the right direction. Well my post on #13 is a question for you to answer. Why should I care what you think or say about me?? I saw it on ZNBC TV and it appears to have some modern equipment … definitely a plus for Zambia. Even in Developed countries such state of the art facitites are out of reach of poor people. I don’t expect anything diffeent for Zambia. Impact will be seen when there’re few referrals to RSA! What’s wrong with a state president opening a privately owned enterprise if invited to do so by the owners? 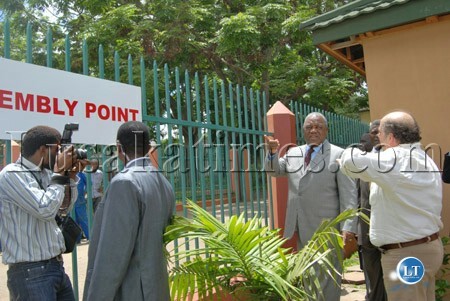 It’s done all over the world – just last year, the Mozambican president opened a privately owned hospital here in Gaborone and I didn’t see anything in the Mozambican press criticizing the guy even when their own medical facilities are a shambles. GO,GO,GO RB. KEEP ON WORKING, ZAMBIANS NEVER APPRECIATE UNTIL YOU DIE. These are the development we want. Some chaps must just stop complaining. so how many poor Zambians will afford to go there..?none..
baobao etc.In pic#2 is that DR.Brian Chituwo?If it is where was Hnr.Simbao? #32: It was actually RB who opened it not the Mozambican President. Twala ubushilu ukutali. Did anyone force you to confess that you know very little about most stuff you comment on and why should I answer your silly question? #9, we’re doing a good work as a team. Even the MMD, PF & UPND cadres know that our university is an internationally recognised research institution. Our recommendations are starting to bear some fruit. But we need more such developments. Our people are tired of politicians being flown to Morningside clinic and India. Bane as much as I believe in private hospitals I have to agree it shows that something is lacking; private inestors can raise money to build a totally new facility yet our government cannot take time to fix an existing one. I fear that regular Zambians will not benefit from this hospital, yet it is a step forward so one cannot be too angry at that. It would have been nice to see some pictures of INSIDE the hospital, instead of just RB and his cronies! These guys are smart. It would be interesting to know what GRZ resources these two used during the function. But it doesn’t matter anyway. They are blatantly campaigning for the MMD. Chituwo is MMD Chairperson of health and RB is officiating as MMD president , but Chituwo is local govt minister and RB is the president so they’re constitutionally covered. That’s why Simbao is not in the picture, although he might have been there. You shod care by asking de question, a dam-n question 4 dat mata. If de comment dd not deserve an ansa, u shoulda jst ignored it. Unasikiya? There will always be a line between rich and poor. The poor will go to government hospitals and the rich will go private we can not change that. There will always be day and night, rich and poor etc etc. THIS HOSPITAL IS A SHAM, THE ROAD LEADING TO EVELYN HONE COLLEGE IS ****ED UP. IT IS A NICE BUILDING BUT THE ROAD LEAVES MUCH TO BE DESIRED, IT IS NOT LIKE PEOPLE WILL ONLY BE USING THE ROAD THAT BRANCHES OFF FROM CHURCH ROAD. PA ZED TULEBAKO SERIOUS. I do not understand FJT comments , Is the boss working hard to build private hospitals as well? You dont the incentives that go with referrals to RSA, INDIA or elsewhere outside the Republic, and so I do not think people will stop being referred outside the country for treatment-especially politicians. The owners of this new hospital must check the behaviour of their expat medical staff who are married but have started pairing off with one another. In this country we have to make sure that nurses in that hospital are not having unhealthy and scandalous affairs with other expats in Zambia which may expose patients at risk. We suggest that the owners review the qualifications, conduct and behaviour of those nurses to ensure that they are behaving in a professional way and are not using even the housing facilities provided to them by the hospital as mini brothels for their boyfriends. It’s appropriate time to make a few plans for the long run and it is time to be happy. I’ve learn this submit and if I may just I want to counsel you some fascinating things or advice. Maybe you could write subsequent articles relating to this article. I want to learn even more issues about it!